The EJOLT project encompasses four thematic pillars: nuclear energy, oil and gas extraction conflicts and climate injustices, biomass and land conflicts; and mining and ship dismantling [and e-waste] conflicts. 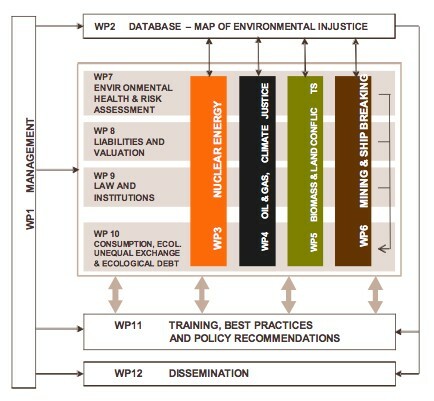 The work of these pillars is supported by five crosscutting axes of intervention, which include the building up of a Map of Environmental Conflicts.The other four crosscutting axes are environmental health and risk assessment, liabilities and valuation, law and institutions and finally, consumption, ecological unequal exchange and ecological debt. The EJOs will examine their case studies through capacity -building and best practice sharing workshops involving both EJOs and researchers. Dissemination and training materials will be made available for use of a diverse set of stakeholders including journalists, environmental activists, parliamentarians, business and government representatives.